Finally, a cost effective, low maintenance IP-based video surveillance solution has arrived. SS Eye is a cloud-based video recording and storage product that hosts your surveillance camera data remotely, allowing you to view live and recorded footage at any computer or smart phone at any time – all you need is an internet connection. In the past, the advantages of IP-based video surveillance were clear, but the cost was prohibitive and the maintenance was extensive. Cloud-based storage solutions allow you to enjoy all of the convenience of IP-based video surveillance without the cost of maintaining a DVR/HVR platform. With SS Eye, your investment is limited to the camera and an internet connection, so the deployment costs are a fraction of the standard video surveillance systems expense. SS Eye maintains your system locally, and since the technology is cloud-based, there is no software to install. In addition to surveillance, hosted video provides innovative ways to protect and develop your business, including remote storage of recorded data, security tour and guard force services. This offering also provides business management services such as monitoring of drive-through-promotions, daily deliveries and cash protection. Increase efficiency of your business and eliminate costs associated with on-site video storage recording systems such as DVR services. Feel safe knowing we are providing an added layer of security by housing your video off-site, ensuring it remains safe from damage and theft. Access feed 24/7 – Be secure knowing that our hosted video is accessible at any time, with an unlimited number of secure user accounts. 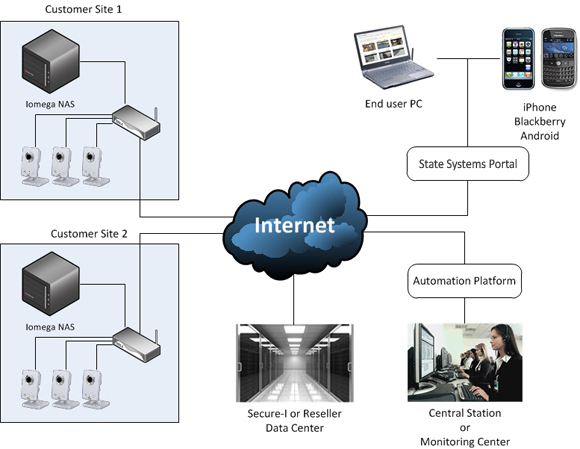 If your company is looking for an IP-based surveillance solution, contact us at State Systems, Inc. Our technicians can design and install an efficient and cost-effective hosted video monitoring solution that you can access from anywhere with an internet connection. Contact us today for estimate for your building or property located in Tennessee, Mississippi, or Arkansas!